The workbench gets my vote for the most important tool in the shop. 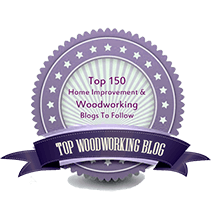 Beyond its obvious function of holding the workpiece, it establishes a reference surface to work against and really forms the basis of a woodworker’s approach to hand tool woodworking. For this reason, a craftsmen personalizes his bench even after taking great care in selecting its style and features. This refinement is bound to continue as a worker’s repertoire evolves. 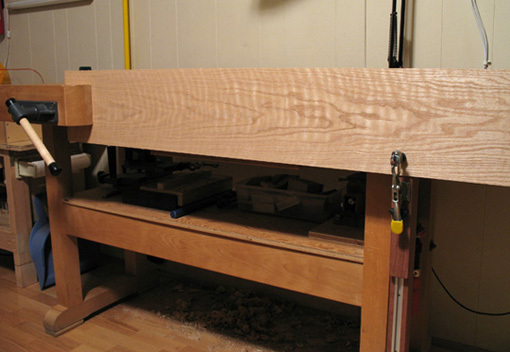 The beautiful board of curly red oak, above, is held both in the front vise and, with a supplementary device, at its right end. This system works for me far better than the traditional “deadman” supports because the right side of the board is not only supported from below but also secured laterally. This is done with a vertical support piece, held in the tail vise, inlaid with T-track which holds a sliding toggle clamp. I’ve detailed this workbench upgrade and many others in an article in the November 2007 issue of Popular Woodworking magazine. (Back issues are available in sets on CD or as individual downloads.) Each of the workbench add-ons in the article has stood the tests of time and practicality in my shop. Click here to view a short video demonstration of a few of the upgrades. 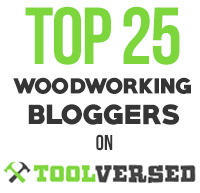 I hope other woodworkers will benefit from them.